We are wrapping up the month of June. The year 2016 is now already halfway done. Amazing how time seems to go faster and faster. The wedding for Mose and Susan is only five weeks away. It’s getting too close way too fast for me! We still want to make noodles for the wedding, and there is still a lot of cleaning that needs to be done. Sisters Verena and Susan were helping us Saturday. The girls’ bedrooms upstairs are all cleaned. We saved the worst for last: the boys’ bedroom. I have been organizing in there. After the wedding, Benjamin will move into Susan’s bedroom. Joseph and Benjamin share a lot of the same clothes. We are separating the clothes so half of them can get moved into Benjamin’s bedroom. Susan has quite a bit of her own furniture in her bedroom, so the room will look empty. As of now, Mose and Susan plan to make living quarters in a small part of our pole building until they find a place suitable for them to live. I am happy Susan won’t be moving off the property yet. She and Mose both will be working, and this way she won’t have to keep a house going. After Joe and I were married, we lived with my dad and mom until Elizabeth was born. We then moved into a trailer house across the driveway until after Susan was born. We then moved to a place about two and a half miles from there. That is where we lived until our move to Michigan in 2004. Tomorrow we are invited to the wedding of one of Joe’s coworkers, Joseph and Edna. We won’t be able to attend but appreciate the invitation. Another of Joe’s coworkers, Jerry, was married to Diane on June 16. We were all invited but unable to attend. We wish God’s blessings to both young couples. May they have a long and happy married life together, letting God lead their way. Lovina’s husband, Joe, loves salad for lunch, and right now all the vegetables for his salad come from their garden. Today is Joe’s last day in the factory until July 11. His vacation won’t be much of a vacation, though, with the upcoming wedding to prepare for. We will take a few days off and take the whole family up north for a few days. I’ll write more about that next week. Saturday, July 2, Joe’s sister Christine and Jake have Joe’s family gathering at their house. They live around three hours from here in Hersey, Michigan. Last Sunday, Jacob and sister Emma and family, my sisters Verena and Susan, and Timothy and Elizabeth were all here for a fish fry, with Joe cooking. He also made French fries. Verena and Susan each brought a salad, and Emma and Elizabeth brought desserts, so it was an easy lunch for me. We set up tables on the porch to eat. The men and boys enjoyed playing croquet in the afternoon while the rest of us just visited and relaxed. 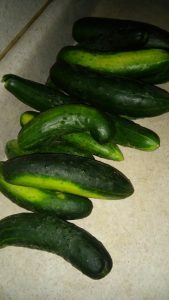 Cucumbers are the crop of choice in Lovina’s garden right now, and this week she shares a favorite recipe for cucumber salad. Our cucumbers are really getting ready fast. We are enjoying cucumber salad a lot. I’ll share this recipe with you. May God bless each of you always! Mix first four ingredients well to make the dressing. Add cucumbers and onion. Refrigerate for at least 3 hours. Serve cold. 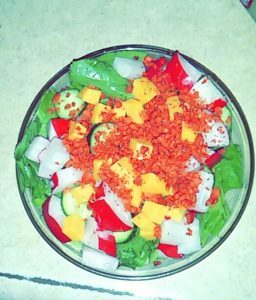 Thank you for the cucumber salad recipe…..it sounds very refreshing to serve on a hot summer day.